Rory McIlroy regained his driving mojo but knows he must step on the gas if he's to end the season with a confidence-boosting win in the DP World Tour Championship in Dubai. Like Paul Dunne and Shane Lowry, who are eight and nine shots behind halfway leader Matt Wallace in the $8 million desert shootout, McIlroy needs a hot weekend at Jumeirah Golf Estates to end his season on a high. Tied for sixth with Francesco Molinari's lone Race to Dubai challenger, Tommy Fleetwood, just three behind Wallace on eight-under par, he was pleased to see some progress with his driving. 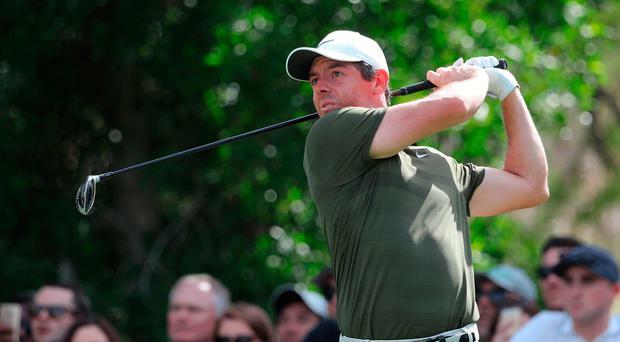 "I have to be pleased," said McIlroy, who added a 67 to his opening 69 but was outscored again by his Masters Tournament nemesis Patrick Reed, who lies just two shots off the pace in fifth after an immaculate 66. "It's a massive improvement considering the golf I've played the last couple weeks. So to shoot two scores in the 60s is great. "The way I've driven the ball the last two days is a massive improvement compared to the way I've driven the ball over the past few months. "I just want to give myself another chance to win a golf tournament. I've given myself plenty of chances this year. I just haven't capitalised on those chances. "I need to shoot another good round tomorrow to get myself right in contention on Sunday, and hopefully if I can do that, I can play some good golf and it would be nice to win for a third time out there." Wallace carded a bogey-free 65 to take a one-shot lead over Danny Willett and first-round leaders Adrian Otaegui and Jordan Smith on 11-under par with Reed a further shot back. But Fleetwood, who needs a win and hope that Molinari finishes outside the top five if he's to retain his Race to Dubai title, is not giving up the chase after going bogey-free for the second day running. He's tied for sixth with Mcllroy, South Africa's Dean Burmester and Thailand's Kiradech Aphibarnrat as Molinari's 73 left him tied for 27th with Dunne on three-under. Graeme McDowell is seven shots behind leader Charles Howell at the halfway stage of the RSM Classic in Georgia. The Ulsterman is seven under par after rounds of 67 and 68.